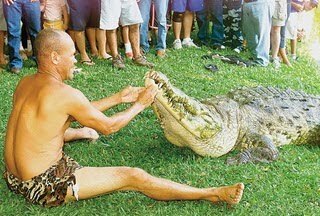 The sudden death by natural causes of the famous tamed Crocodile “Pocho” brought tears to Costa Ricans and other fans around the world. Our deepest sympathies to Chito for the loss of his good friend. May Pocho Rest in Peace!! For the history of the famous Pocho and Chito, read on…..
BROUGHT BACK BY POPULAR DEMAND!! At least once a month someone asks me about “Chito”, better known as “Tico Tarzan”, so I thought I would repeat this post! Imagine upon moving to a foreign country one of the first persons you meet is fondly known by all as ¨Tico Tarzan¨! Officially named Gilberto Shedden, this 50 year old Costa Rica native fisherman, better known to his friends as “Chito”, has gained this nickname by training and playing with his good friend “Pocho”. I know you’re thinking it’s a cute little monkey or chimp, thus the title ¨Tarzan¨, but you would be VERY mistaken. 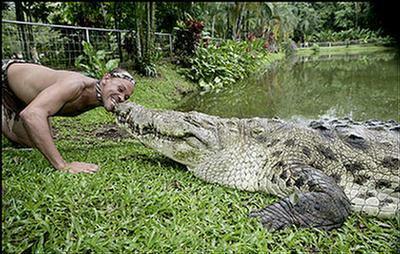 Pocho is Chito´s fully grown, pet American Crocodile! 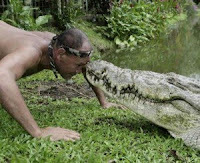 Rolling the large reptile on its back, pushing his head of razor sharp teeth under and above the water, as well as tenderly kissing Pocho right on the nose, this is no average Tarzan by any means! 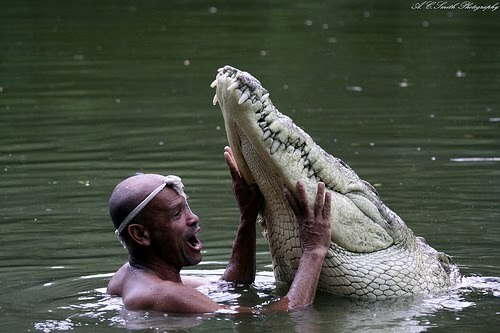 Even for Chito, who grew up in the jungles of Costa Rica, their games are much more than a planned tourist trap spectacle, it is a clear demonstration of an unusual friendship established over time between a normally dangerous crocodile and an anything but normal human who saw one of God’s creatures in need. I’ll never forget the first time we went to Chito´s house to have a few ¨cervezas¨ and Chito wanted to introduce us to his new friend. With Chito, you never knew what to expect, but nonetheless, I was a bit taken aback when he opened a door and there was Pocho! As a ¨newbie¨ to Costa Rica and this small Caribbean Village on the Atlantic side of Costa Rica, I kept thinking to myself, ¨Can this be normal?¨ Happily, it is not, but as one gets to know the eccentric Chito, it just really did not seem that odd either, as he always had a menagerie of wild animals that he was in the process of nursing back from the dead, with the hope of returning them to the wild! to the remote location of this small village. Now relocated to a small lake on Chito´s other farm on the outskirts of the town of Siquirres, this unlikely duo attracts multitudes of people, both National and International travelers weekly to experience for themselves the ¨Tico Tarzan Show¨. Dressed only in well worn shorts and his customary sweat band in place on his forehead, Chito enters the water with absolutely no safety equipment or even ambulance drivers on call, where he leads Pocho, and at times Pocho leads Chito, through a series of acrobatic stunts and amazing tricks, including the lifting and slapping of his enormous tail with great force on the water, as visitors look on at the gigantic reptile in amazement from the safety of the railing of the ¨typical¨ style lakeside restaurant or ¨soda¨. It is estimated that Pocho is around 50 years old, weighs approximately 990 pounds and measures in the area of 4.5 meters. The American Crocodile is a species of crocodilian found primarily in Central America. It is the most widespread of the four species of crocodiles found on the entire American Continent. Populations occur from the Atlantic and Pacific coasts of southern Mexico to South America and stretching as far as Peru and even Venezuela. There is a remnant population of about 2000 in Florida, United States. The habitat of the American crocodile consists largely of coastal areas, though they are quite common in canals and other inlets, so caution should be exercised when in these areas. The American crocodile is larger than some other crocodile species, with some males reaching lengths of 6.1 metres (20 ft) in Central and South America. Full grown adult males of this species have no natural predators and are capable of preying on virtually any animal unfortunate enough to be at the waters edge. It is estimated they can live up to 70 years in captivity, so Chito and Pocho may continue to entertain us for many years to come, barring any accidents that is! Most people would think that the famous Costa Rican coffee would be the obvious morning drink, but actually, the traditional breakfast drink is called Agua Dulce (“sweet water”). Made from the “typical” local ingredient “Tapa de Dulce”, these familiar (or not so familiar) molded small cakes of firm compacted brown sugar product are very similar to the North American “brown sugar” we buy in a bag. 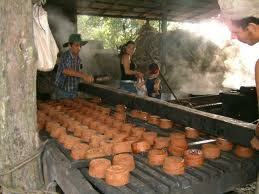 Also known in many Costa Rican homes simply as “Bebida”, the sugary cane liquid is extracted, boiled, evaporated and eventually poured into conical molds, which are cooled, at which time the tops are cut off making them tapas (“lids”). The traditional drink of “Agua Dulce” is made by cutting or scraping off a bit of the tapa and gently dissolving it in boiling water or hot milk. Delicious! Know by many names throughout the world, Tapa de Dulce can also be called “Panela”, “AtadoDulce”, “Raspadura”, “Rapadura”, “Chancaca”, “Papelon”, “Piloncillo”, “Panocha”, “Empanizao”, “Melaza y Cuyo” and many many other varying names depending on the region and/or country you are in at any given moment. 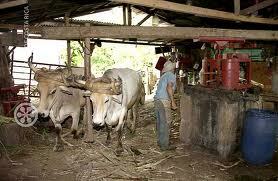 Consisting completely of Sugar Cane juice, to make the popular molded Tapa disks old traditions held to using oxen or sometimes donkeys or mules to run the small rural processing “plants” better known as “Trapiches”. Not being easy to extract the sugary juice from the cane stalks, the animals were much more efficient back in those days, but alas…today it is almost completely a mechanized process being much more efficient and sanitary then using the animals. Back in the early 1900’s, Costa Rica had more than 1600 Trapiches, but today they have almost completely dissappeared, and a national cry has gone out to not let this tradition completely disappear. Costa Rica Hotels and Tour Operators have projects in the works to incorporate the Trapiche Farms in to rural tourism centers, directly sharing the experience with visitors from around the world. Unfortunately, this idea is far from fruition at this point. Not a totally empty calorie sugar product, Panela or Tapa de Dulce differenciates itself from ordinary white sugar with measurable amounts of glucose, fructose, proteins, as well as minerals such as calcium, iron, phosphorous, and trace vitamins such as absorbic acid. It’s said to have “medicinal” properties as well, but more on that below! When preparing a cup of Agua Dulce, add a small chunk shaved off the molded Tapa de Dulce sugar block and mix with a small amount of hot water, working it until it’s the consistency of honey. Then either add hot water (“Agua Dulce”), or hot milk (“Bebida”) and enjoy! In the Atlantic region of Limón, the Agua Dulce is served cold and mixed with lemon juice and a hint of ginger. This is known as “Agua de Sapo” (Toad Water) or “Hiel” and is another refreshing way to enjoy sugar cane juice. But why stop there? Do you have a cold? Mix the Agua Dulce with lemon juice and an ounce of “Guaro” (Cane Liquor), which is said to be the best remedy in Costa Rica and sure to make your pains go away! Colombia is the leader in the Panela industry, providing an important source of employment for that country with around 350,000 people working in approximately 20,000 Trapiches or Panela Farms.